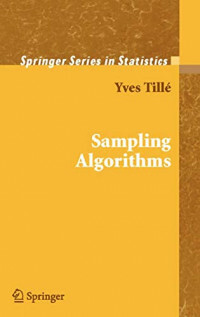 This book is based upon courses on sampling algorithms. After having used scattered notes for several years, I have decided to completely rewrite the material in a consistent way. The books of Brewer and Hanif (1983) and H´ajek (1981) have been my works of reference. Brewer and Hanif (1983) have drawn up an exhaustive list of sampling methods with unequal probabilities, which was probably a very tedious work. The posthumous book of H´ajek (1981) contains an attempt at writing a general theory for conditional Poisson sampling. Since the publication of these books, things have been improving. New techniques of sampling have been proposed, to such an extent that it is difficult to have a general idea of the interest of each of them. I do not claim to give an exhaustive list of these new methods. Above all, I would like to propose a general framework in which it will be easier to compare existing methods. Furthermore, forty-six algorithms are precisely described, which allows the reader to easily implement the described methods. This book is an opportunity to present a synthesis of my research and to develop my convictions on the question of sampling. At present, with the splitting method, it is possible to construct an infinite amount of new sampling methods with unequal probabilities. I am, however, convinced that conditional Poisson sampling is probably the best solution to the problem of sampling with unequal probabilities, although one can object that other procedures provide very similar results. Another conviction is that the joint inclusion probabilities are not used for anything. I also advocate for the use of the cube method that allows selecting balanced samples. I would also like to apologize for all the techniques that are not cited in this book. For example, I do not mention all the methods called “order sampling” because the methods for coordinating samples are not examined in this book. They could be the topic of another publication.